For much of the 1800s almost everyone in the world wanted to come to Victoria. When gold was discovered in 1823 the flow of wide-eyed prospectors started as a trickle and by 1851 it bad become a full blown torrent. Strikes at the Central Victorian towns of Bendigo, Beechworth and our own Ballarat, sparked a second rush and soon two tonnes a week of the precious metal were flowing back to Melbourne. It was a heady time that saw everything from bushrangers to rebellions placing an indelible hallmark on Australia. Today almost all of the prospectors are gone but tourists still flock to Ballarat to catch a glimpse of the glint of gold. Prospecting tours are still a popular pastime as visitors and locals alike take to the push for anywhere from a few hours to a few days to learn about the rugged miners of the past, and maybe to strike it a bit lucky themselves. Ballarat itself is filled with memories of the legendary boom times. 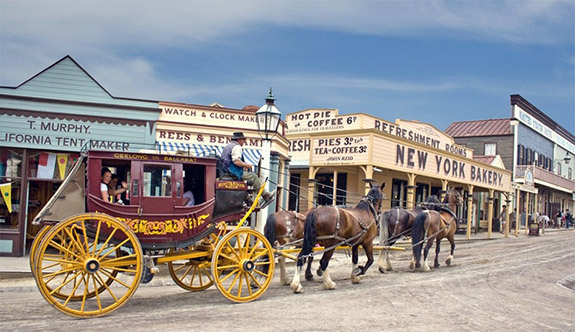 Places of interest include Sovereign Hill, plus various museums, heritage trails and even tours of old gold mines dot the landscape, as do the beautiful old buildings. The history of the area today is almost as rich as the gold fields of the past and whether you’re in town for a day or a week, or if you’ve lived here your entire life, there are few better places than Ballarat to delve back into one of the most significant periods in Australia’s European era.